The holidays can be expensive, especially when you are the host. Food is pricey on its own but decor can sometimes be quite frankly unaffordable. This year the HUBS and I spent most of our funds buying (slash somewhat DIY'ing) our new dining table. We desperately needed an 8-seater, especially since we were hosting thanksgiving for our family! Turns out even DIY'ing a dining table isn't cheap! So I had to make some pretty drastic modifications to my thanksgiving decor budget aka DIY the entire thing. I LOVE decorating, especially for the holidays. It really brings warmth & personality to the home but more than that I love when my creations inspire others to create! So I set out to create a marvelous Thanksgiving table setting without buying readymade decorations. First, I waited until Halloween was over, and scoured the city for some pumpkin varieties. My friend and I went on a mini scavenger hunt to four different grocery stores before we found the jackpot at Tom Thumb! They had tons of mini gourds of all shapes and sizes at a fraction of the cost since Halloween was over. Score! We purchased about 25 pumpkins, getting a good assortment of sizes and shapes (color didnt really matter since we were going to spray paint them). We came home and immediately removed any labels before adding two coats (in some cases three) of white spray paint with primer. We thoroughly let these dry (between layers) in the sun before marbling. To marble the pumpkins we used this tutorial. We were able to apply the same principles and selected three different shades of blue, one light gray, and one pastel teal nail polish. The more refined your color selection the more elegant the overall result. 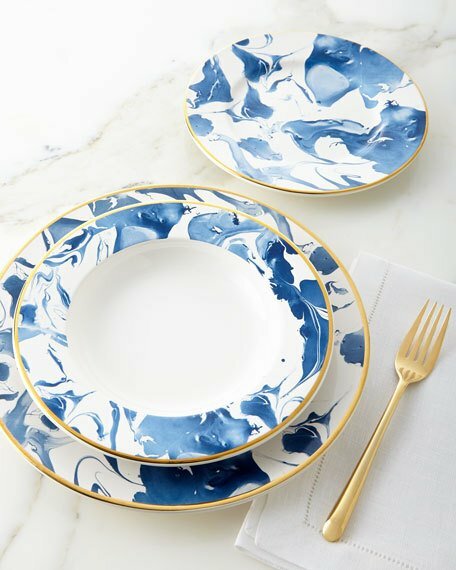 Choose colors that compliment or can be found in your place setting - in my case my plates were white and blue and my accent color for thanksgiving was raspberry. It took about a full 24 hours for all of the pumpkins to dry (the smaller pumpkins dried MUCH faster than the big one). After these were done, I arranged them on our dining table (I did put small paper towel coasters under each pumpkin just in case the paint wasn't completely dry). I was originally planning on buying table/placemats but couldn't find exactly what I was looking for. Instead, I ended up printing cheap paper mats with a fun original watercolor print in my selected colors. I figured white placemats were bound to get dirty so why spend the time or money to make fabric ones when I would likely have to throw them. Boy am I glad I went this route, because half the mats post dinner had severe stains. I designed this print in Photoshop and had it printed on 24 X 36 inch cheap paper at Office Depot. I also decided to design hand-lettered menus and name cards that were also printed at Office Depot. I wanted our table setting to be inspired without being too much going on. The key in making this happen is dialing back and restraining from uncensored color use. Everything involved the same three main colors: blue, white and my accent raspberry. Initially I was really nervous about how everything would come together but it really turned out beautifully! I purchased some blue, white and teal floral napkins on clearance from Anthropologie last summer. Unfortunately, at the time they only had 4 left and were completely sold out online. I had some leftover fabric from making my sister-in-law a floral watercolor lehenga, so I used the rest of it to make 4 more napkins to complement my Anthro ones. Both sets of napkins went perfectly with each other and the rest of the table. 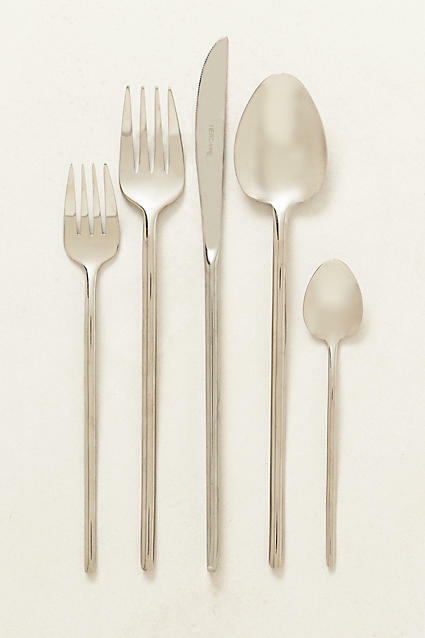 Lastly: the actual flatware and dinnerware. When the HUBS and I got married we purchased these really nice organic shaped ceramic table setting from West Elm (plates shown above). 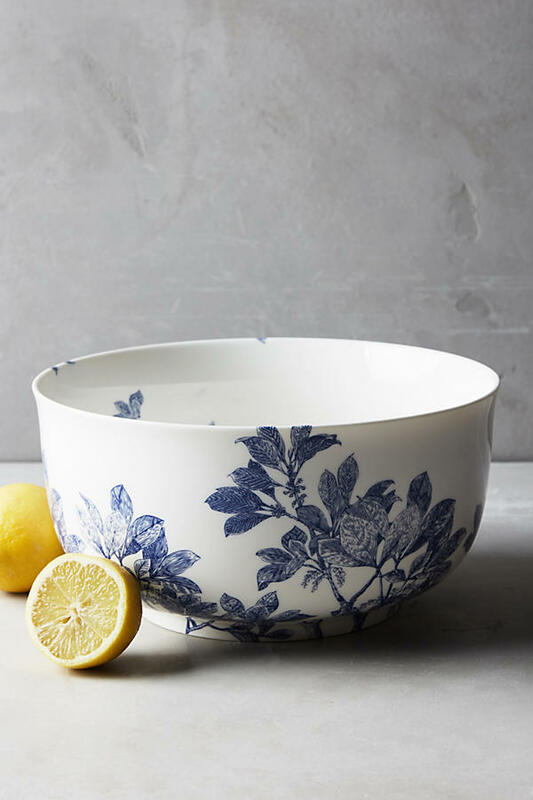 Then a couple weeks ago, we spotted this watercolor bowl at Ikea. When the HUBS saw it, he knew that I would be buying them. He didn't even contest at all! We are obsessed with this flatware (the HUBS calls them the "fancy spoons" 😂) which can be found here. I hope you found this tutorial helpful and informative. Happy Thanksgiving! !